StrengthsQuest is an online assessment developed by the Gallup Organization, that helps you discover, develop and apply your unique talents in order to achieve academic, career, and personal success. After completing the 30-minute questionnaire, you will receive a customized report which lists your top 5 talent themes, and provides ways in which to develop them into strengths. 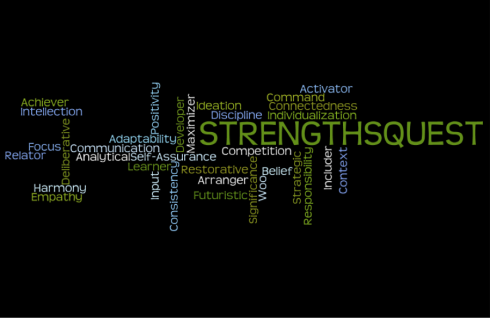 All Full Time Staff are required to take the StrengthsFinder inventory. Various trainings are offered in the Fall and Spring semesters, including a 2-hour introductory course, that are intended to assist staff with understanding their themes and utilizing them in the workplace. If you wish to see our training offerings or need to register for a training session, please visit the Trainings and Registration page. Strengths is not only used by our Full Time Staff in the Division but it is also used by over 200 student leaders, clubs and organizations!